Romantic getaways for the literary lover include a stop to see Mark Twain’s octagonal study where he wrote his timeless classics, Huckleberry Finn and Tom Sawyer. The Chemung Valley History Museum is also top on the list to learn about his life. Watkins Glen State Park is located at the southern tip of Seneca Lake. The park boasts 19 stunning waterfalls along a 2-mile walking trail. The trail is paved and fairly easy to walk but there is over 800 stair-steps spread along the Gorge Trail. For the photographer and nature lover, Watkins Glen State Park is at the top of the list for beautiful romantic getaways. The Finger Lakes wine country is home to three wine trails – Keuka Lake Wine Trail, Seneca Lake Wine Trail, and the Cayuga Lake Wine Trail. They also boast a Craft Beverage Trail with numerous craft brewers, distillers, and cideries. There are over 120 wineries, distilleries, brewers, and cideries along these four trails. What could be more regal than spending a romantic getaway weekend in the queen city of Charlotte, North Carolina – named after the German Princess Charlotte of Mecklenburg-Strelitz. For a short one day itinerary, consider a cooking class with local celebrity Chef Alyssa Wilen. She offers hands-on classes focusing on vegetarian, Thai, Paleo, and specialty classes for Super Bowl and chocolate confections. Taking cooking classes together is a fun date activity. My husband and I did one in France and had a fabulous time. After your afternoon learning a few new recipes, head over to the Wooden vine, a cozy wine bar located in the heart of downtown Charlotte. A warm earthy vibe makes the Wooden Vine a perfect spot for a romantic night. Boasting nearly 300 wines by the bottle and 50 by the glass there is definitely something to pair with the gourmet tapas from the menu. The Big Island of Hawaii is another superb choice for romantic getaways and retreats. The warm ocean breezes, lush rainforests with towering waterfalls, and the sweet fragrance of the plumeria hanging heavily in the air all add to Hawaii’s romantic atmosphere. The Four Seasons Resort near the Kona side of the island is a luxurious retreat offering a variety of dining from upscale gourmet restaurants to open-air beachside meals. The resort also has a delightful spa with calming couples massage packages for the ultimate in opulent romance. To get the most out of your stay on the Big Island I suggest renting a car. There is much to see and do. Orchid farms, coffee plantations, hiking lava fields, exploring towering fern forests, night snorkelling with manta rays, and deep sea fishing is just a small sampling of activities that would make this a trip to remember. Tucked between Cypress Creek and the Blanco River in the beautiful rolling hills of Texas Hill Country is Wimberley. One of Texas’ romantic getaways, this eclectic small town has a relaxed artistic feel. Wimberley is reminiscent of a time gone by with unique art galleries, gift shops, and quaint B&B’s and is an easy 45-minute drive from Austin. For a special romantic afternoon, stop by the Rough Creek Lavender Fields. Take a tour or pick your own fragrant lavender from their over 5,000 lavender plants which bloom in June. Rough Creek also offers special events and herb classes. Wimberley is home to several wineries, craft brewing companies, and rum distillery Cypress Creek Reserve. If you just want to relax with a glass of craft ale or wine while enjoying a stunning view of the valley, make your way to The Shady Llama. If you plan on checking out this small family run operation, be sure to check their Facebook page for opening times. They are an outdoor bar and hours are dependent on the weather. For romantic getaways in Arizona check out Bisbee. Just under a two-hour drive from Tucson, Arizona is Bizbee, a bohemian town rich in history, music, art, outdoor activities, and eclectic dining experiences. In the late 1800’s, copper along with other minerals was discovered in the Mule Mountains putting Bisbee on the map. Take a tour deep into the historic Queen Mine, one of the largest copper mines in the world for a look at early mining life. The Queen Mine was in operation for 100-years before they ceased production in 1975. Bisbee is home to Arizona’s smallest bar, and I mean – really small. It is a converted hotel room with 4 bar stools and a table for two. The Room 4 Bar has all the necessary fixing to shake up nearly any cocktail. Join them for an off-the-wall romantic evening of live music and art. Stay in one of Bisbee’s varied B&B’s for a truly unique adventure. So, what are you waiting for? Start planning your next romantic getaways now and bring adventure into your life. 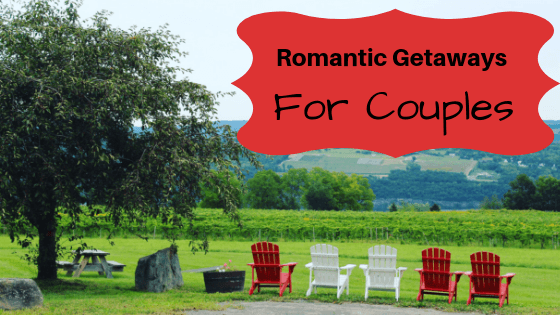 Thank you for reading this travel nugget of knowledge about romantic getaways. This article may contain an affiliate link or two, which does not affect you in any way, but will allow Empty Nestopia to continue to bring you travel tidbits. Great ideas for getaways. We travel alot and I had not heard of some of these places. Hi Chantay! Thank you for your comment. I am thrilled that I was able to put some new spots on your radar. Happy traveling!